So you want to know a little more about how an oxygen sensor works? Well, as you may already know there are many sensors required for a modern engine to function, but arguably none are as important as the oxygen sensors. These sensors read the amount of unburned oxygen in the exhaust. The computer then uses this reading to balance the fuel mixture. As oxygen content in the exhaust increases (known as a lean condition) the sensors voltage reading decreases. This signals the computer to increase the amount of fuel the injectors are delivering. In turn the oxygen content in the exhaust decreases (known as a rich condition). The oxygen sensor voltage increases as a result of this richening, and the computer reacts by reducing fuel flow. As fuel quantity decreases we return to a lean mixture, and sensor voltage drops. This process repeats for as long as the engine is running. This continuous feedback loop is the heart of the fuel control system. Typical lean voltage readings are between 0 and .3 volts and rich readings range from .6 to 1 volt. An ideal fuel mixture (14.7:1) will produce a voltage of around .5 volts. So why not just maintain a constantly metered fuel amount that varies with throttle position? Well, many factors affect the amount of fuel required to maintain a 14.7:1 ratio. Some of these factors include fuel quality, atmospheric pressure, humidity and more. Thus the need for O2 sensors! Sensor switch rates vary, but most modern sensors average a minimum of half a dozen switches per second. The older sensors switched as slow as once per second, so you can imagine the improvement on emissions new style sensors have made! Old style oxygen sensors used before 1982 were of the 1 or 2 wire unheated type. These sensors would not actually begin to register a correct reading until the exhaust heated the sensor to its operating range. This resulted in the computer running in "open loop" operation (using preset fuel values which actually run the engine rich) for longer periods of time. All newer style sensors are "Heated Oxygen Sensors" (HO2S) which incorporate a heating element used to bring the sensor up to operating temperature sooner, usually in less than a minute but as quickly as 10 seconds is possible! The heating elements also prevent the sensors from cooling down when the engine is idling. These heated sensors are normally of the 3 and 4 wire design. There are a few different style sensors, that vary by chemical make up and design but their purpose and function remains the same. The engineering behind these is beyond the scope of this page, but there are a few things to consider. Oxygen sensors compare the oxygen content in the outside air to the oxygen content in the exhaust. The outside air is brought into the sensor either through a vent in the sensor housing or through the wiring connector itself. Some sensor types generate a voltage as oxygen content in the exhaust changes and some have a varying resistance. 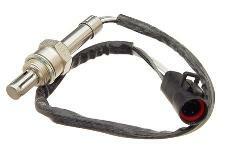 The newest style, Heated Wideband O2 Sensors, have a voltage range of between 2 and 5 volts. Despite all of these differences, and actual readings produced by the sensors, the computer processes the information so that we have the expected 0 to 1 volt readings. There are a couple of exceptions, of course. Some Heated Titania Type O2 Sensors can produce a voltage as high as 5 volts. This reading is not altered by the computer. Another design of the same style sensor is configured to read values the opposite of what you'd expect. High voltages indicate a lean mixture and low voltages a rich mixture. These 2 types of oxygen sensors are not common and were used mostly on a few Nissan, Jeep and Eagle applications. There's always got to be an exception right! Engineers, yeah I know! You will also notice on most post '96 applications, there is a second set of oxygen sensors beyond the catalytic converters. These function the same as the front O2 sensors but their readings are used differently, and their purpose is to measure the efficiency of the converters, not monitor engine fuel ratios. Please refer to our article on Oxygen Sensor Codes for Diagnostic Help and further description of the O2 Monitors. This article provides valuable diagnostic assistance and test procedures as well as likely causes of rich or lean oxygen sensor codes. I hope you have found this information helpful!